2 bedrooms with 1 queen bed and one full bed, 1 bedroom with twin bed, plenty of parking, room for boat as well, dock, paddle boat and row boat available or bring your own kayak! Great fishing, 90 minutes from Montreal, bring your passport and experience a great city. Firepit right out front, enjoy the lake front while having s'mores. Separate Screen house on the lake side. Bikes are also available along with a basketball hoops on a cement slab. Rent 18 Kirk and Fitts as well with family and friends (VRBO #348456). We bought this property several years ago to have a quiet place to enjoy on the lake. We have made many improvements over the years and look forward to sharing our cottage with our guests. The picture shows Jay on the left, Mary Kim and Charlie on the right. Enjoy your morning cup of coffee out on the large deck at the end of the dock. Great place for kids due to the quiet dirt, dead end road and the shallow waters of the bay. This is a great spot on Lake Champlain - the bay is quiet and clean - a perfect spot for any water activities. The water is shallow for a ways out so it's great for swimming with young children. Also very little traffic due to the dead-end dirt road. Close to Montreal or New York and 45 minutes from the beautiful city of Burlington. 90 minutes to Montreal, Canada, beautiful city. Casinos within a couple hours in NY. Great house with a beautiful view and amazing sunsets! We had so much fun boating, fishing and wading in the super clean shallow water. Smores by the fire every night was a great way to wind down the day. We fell in love with the area and can't wait to return! Property fit my need perfectly, had the nicest dock and swimming was great in the shallow bay! Everything went smoothly from the first email to packing and leaving. So much we are thinking about a return trip next fall. Stunning sunsets, clean water, house fully equipped along with plenty of boating activities! Great camp on Lake Chanplain. My group really enjoyed our week at the camp. 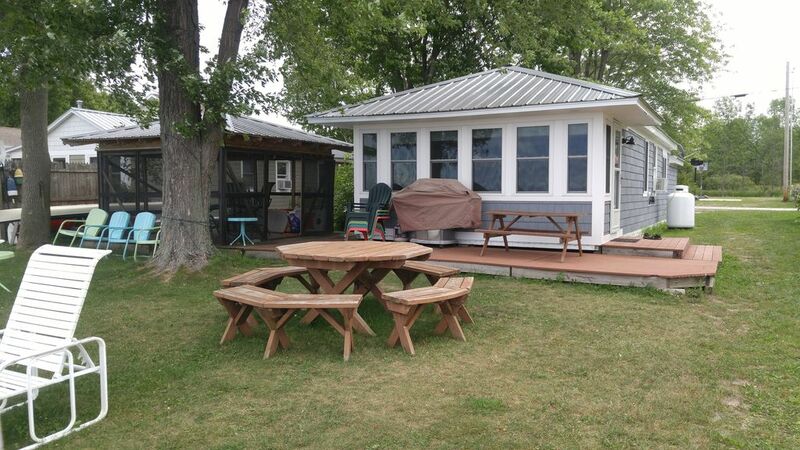 It's a great spot to relax and use as a home base for a vacation on the lake. We brought two boats (a bass boat and a 20' bow rider). The dock was too far out of the water to use but there are two moorings. The boats stayed safe even on windy days on the moorings. I wouldn't try bringing a large boat or a sail boat, at least not when the lake is low. You can walk right out to the moorings during average water levels. It's really shallow in this whole part of the lake so it's not really somewhere an adult is likely to enjoy swimming but kids and dogs should enjoy it. There is a sandy beach and shallow area just across the cove to the north which is fun to hang out and swim at. The camp itself is clean and classy and fun to spend time in when the weather is bad. The porch and yard area is great. There is plenty of parking. Definitely use the Rouses Point boat launch instead of the Vermont launch next to the bridge. The kitchen is well stocked for you to cook your own meals. The neighboring camps aren't too far away but that didn't bother us at all. It felt private enough. They all appear to have around 100' of frontage which isn't too bad. We would definitely go back. Celebrated my husband's 40th birthday here with our twin 2 yr old boys and dog and couldn't have asked for a better vacation! Best dock on the lake!! Montreal Canada within 90 minutes, bring your passport. Casinos / Gambling within a couple hours in NY.